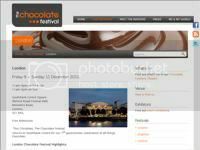 Chocolate Festival. Merry X-mas! - Mmmlingerie. A Taste of Beauty. Sample the delights of the world’s best Chocolatiers. From William Curley and Bill McCarrick to Damian Allsop and Paul Wayne Gregory.